ItemI-60767 - Group posed on a log near a stream. ItemI-60768 - Mrs. Donald Fraser and Helen Fraser cooling off on a hot day. ItemI-60782 - Mrs. Philip H. Hind. ItemI-60825 - The Honourable W.C. Shelly. ItemA-09226 - "Eglise catholique de Maillardville, C.B., photo D.A.C. "; the original French church, the Roman Catholic Church Notre Dame de Lourdes at Maillardville, BC. ItemA-00106 - The SS Otter at Bella Bella. ItemG-03586 - Oak tree on the Sir James Douglas estate; Victoria, BC. ItemNA-42005 - Canadian Pacific Railway Railway Station From Granville Street, Vancouver. Item A-09226 - "Eglise catholique de Maillardville, C.B., photo D.A.C. "; the original French church, the Roman Catholic Church Notre Dame de Lourdes at Maillardville, BC. "Eglise catholique de Maillardville, C.B., photo D.A.C. 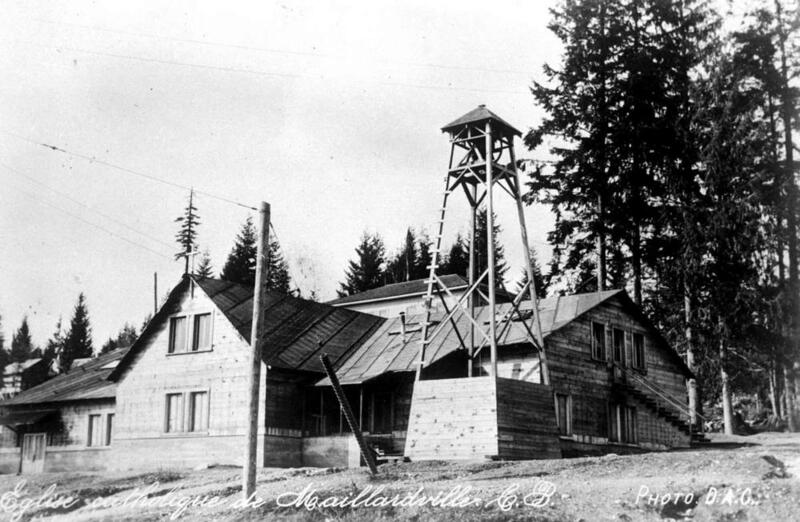 "; the original French church, the Roman Catholic Church Notre Dame de Lourdes at Maillardville, BC.